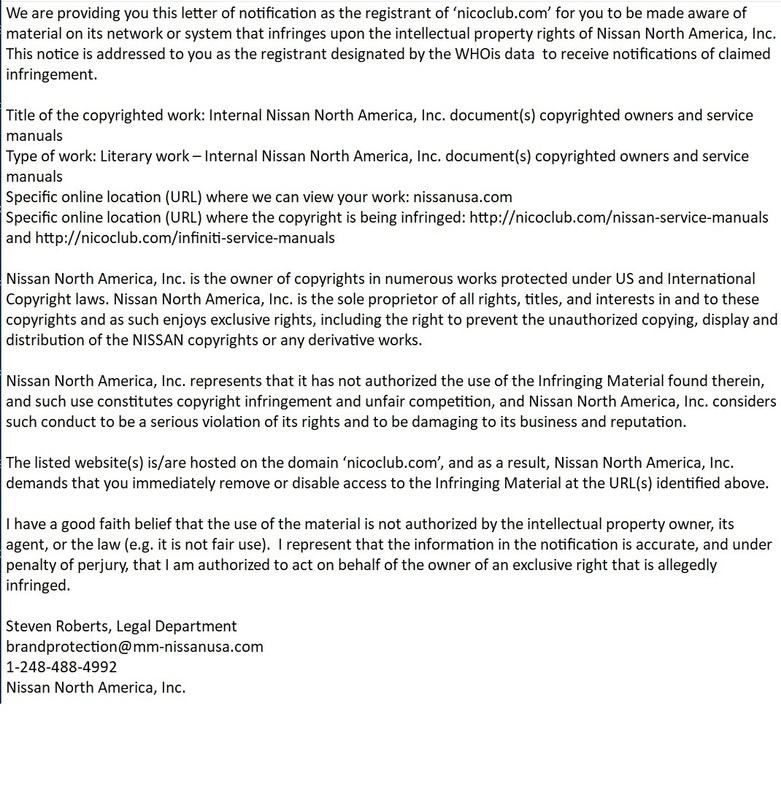 Nissan told nicoclub to take down all service manuals from their site. Crazy! I thought they had a disclaimer on their Service Manual page that said they paid to list them. I did not see that disclaimer just now. Either I looked in the wrong spot or it was removed. The link in your sig is still good. Hmmm. Yeah, that was the first thing I checked. "Beginning in 2002, the owner of NICOclub began purchasing these documents from Nissan annually, as a reference to assist with countless technical questions posed by NICOclub’s readers. To date, this has been common knowledge among our contacts at NNA, both staff and management. Because of the ease of access, the majority of Nissan employees that needed access to FSMs utilized the system here, rather than the cumbersome internal system at NNA. As an independent entity, and the web’s largest supporter of Nissan and Infiniti owners, NICOclub has always placed the needs of enthusiasts above brand loyalty. While NICOclub has never charged readers for access to these resources, intellectual property allegations are not taken lightly. We realize this may hinder your efforts to research issues with your vehicle. We simply do not have the resources to dispute Nissan’s directive"
if they OWN them, then they need to reply to the lawyers letter and say so. Provide copies of payments and other evidence. If they just give up from one letter then thats a bit wierd. Obviously the arrangement they had is over. NICOclub probably didn't purchase the documents outright. They might have purchased access. My hard drive shows I downloaded all of their Hardbody service manuals back in 2014. I've also downloaded the 2003 Frontier and 2012 Altima files. It used to be a lot easier before they modified their website to handle PDF files internally. Before, I could simply right-click a file and select "Save As...". Now, I have to wait for it to load up in their Website Viewer, then save a copy.